Today marked the 17th “Grand Prix de la Baguette de Tradition Française de la Ville de Paris” which translates to the “Best Baguette in Paris” contest. By luck of the draw, I managed to be selected as one of the jury members and spent an incredible 4 hours sitting next to Ghislaine Arabian tasting close to 150 baguettes. It may seem hard to believe, but a lot of mediocre bread can be found in France. Walk into your average corner bakery and if you don’t know what to look for, or to ask for, you risk walking away with a very average, and at times inedible, baguette. Bread has a long and intricate history in France and was once the main sustenance for a large part of the population. Bread consumption began to rapidly dwindle in the 20th century falling from 620 grams per person in the early 1900s to just 150 grams in the early 1990s. Unfortunately quality began to suffer as well. Bread quality plummeted during the two World Wars when rations and conditions made bread making particularly difficult. Modernisation of the industry in the 1960s didn’t help. The thirst for “white” bread made from flour enhanced with additives like ascorbic acid and fava bean flour, over kneaded and quickly churned-out without long fermentation, produced a white, but tasteless crumb, and almost spelled the end of a century’s old tradition. Thankfully, a handful of artisan bakers, millers and experts fought to preserve the integrity of French bread and insure that truly good bread remained a part of French heritage. The State had a hand as well and in 1993 enacted a “French bread law” which stated that “baguettes de tradition” must be mixed, kneaded, leavened and baked on premises, without ever being frozen. They must also be additive-free and can contain only four precious ingredients–wheat flour, water, salt and yeast. So, if you are going to buy a baguette, make sure it’s a baguette de tradition. But even the “baguette de tradition” label doesn’t guarantee a superior product. So how does one judge good bread? According to Steven Kaplan, an American who is considered the world’s authority on bread, there are several things to look for: appearance, aroma, a dense yet aerated cream-colored crumb, and of course the taste. Ever since the 1993 decree, Paris has held a competition for the best baguette, which brings together some of the city’s best bakers all vying to win the coveted prize which brings not only prestige and 4000 Euros but the chance to supply the French Presidential palace with bread for the year. This year’s competition boasted a record 163 entries. 22 were eliminated off the bat, which left 141 baguettes to judge by the 15 member jury, which included several prestigious bakers (Franck Tombarel, last year’s big winner, and the runner up, Benjamin Turquier); a big name chef (Ghislaine Arabian), a Englishman (Stephen Clark), a Meilleur Ouvrier de France (butcher Thierry Michaud who has some of the best lamb in Paris), other notable members of the food community, and five lucky winners, myself included, who entered a contest sponsored by the Mairie de Paris. It was an absolutely incredible experience and for now I can’t imagine looking at another baguette. Mound after mound of baguettes were brought as we noted 4 points each for: appearance, baking, aroma, the crumb, and of course, the taste. Panel members argued, for some certain baguettes were “trop cuite!” or too cooked, while for others it was just right. On and on it went until the last baguette was tasted and the Mayor’s office went to tally the vote. Surprisingly only a handful of us stayed on to hear the final results. I had tasted an ungodly amount of bread and wasn’t going to leave until I heard the winner’s name pronounced. At last it was made known that number 86 had the best overall score and the sealed envelop revealed that it was Djibril Bodian of Le Grenier à Pain Abbesses in the 18th arrondissement, who incidentally placed 5th last year. Minutes later a phone call from the mayor’s office announced the news to which a very moved and surprised Mr. Bodian replied “Vous êtes sur de que vous dîtes?” “Are you sure of what you are saying?”. 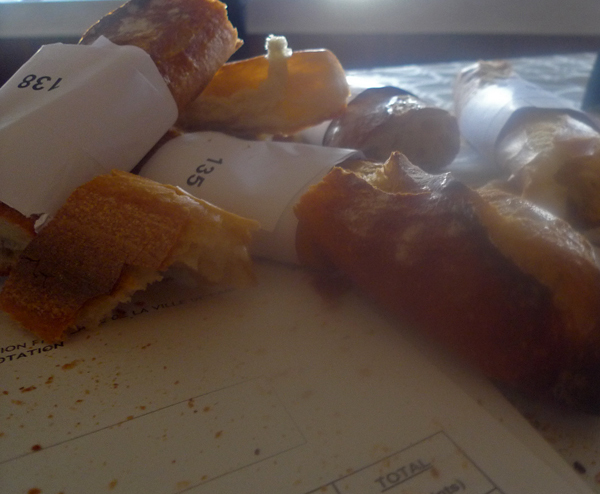 I can’t say if Mr. Bodian’s bread was indeed the very best because we tasted many wonderful baguettes today. I can say however that the top ten chosen all produce a very fine baguette and are worthy of a visit. 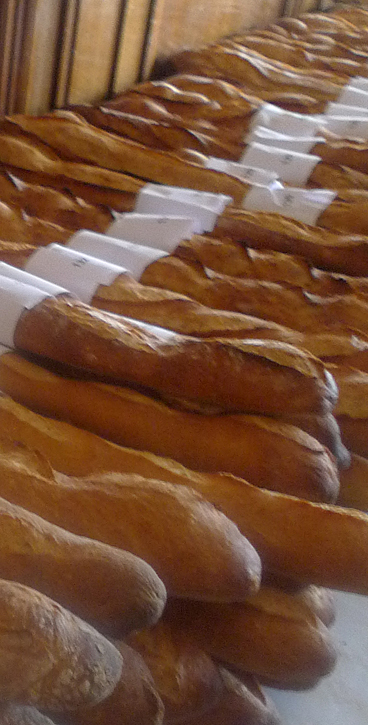 Subscribe to comments with RSS	or TrackBack to 'The Best Baguette in Paris 2010'. As of now, I don’t know if I can even look at another baguette for some time! I love having an inside peek at this competition! So glad that you were able to go and to share this with us. I had Professor Kaplan as an undergrad at Cornell for a history class about food. That video nails his personality spot on. Wow, you are very lucky, the video is hysterical and his book “Good Bread is Back”, while not easy reading, is fascinating. I was already reading it when I was selected and felt very well prepared having read it. nice report Phyllis – thanks! The recipe is simple–wheat flour, water, salt, and yeast, nothing more, but the magic is to take those very simple ingredients and create a baguette, not such an easy task. I will try to find one to post here. Oh goody, our brief moment of reflected glory! My wife and I spent 3 months last year living near the Métro Pigalle. Most days I would go out, walking insouciantly along the Boulevard de Clichy past the guys trying to coax you into a dark place for a lap dance — it really is a “mixed” neighborhood — and up rue Germain Pilon to rue des Abbesses, where I would head for my real target, Le Grenier à Pain Abbesses. It really is a great baguette, though the Flûte Gana down the street at the corner of the rue des Martyrs is pretty good too. A couple of years ago we were living in the 15th and there is a pretty good Grenier à Pain there on the rue St. Charles as well. I could not agree more!! I have been to both now and the only reason I would say les abbesses is better is because mine was fresh out of the oven with steam still coming out as I broke it…but the one in the 15th was my favorite boulangerie when i lived over there! I was in Paris last month and I compared #1 Le Grenier à Pain Abbesses and #2 Daniel Pouphary, (La Parisienne) to the handshaped artisan baguette at Wohlner’s in Omaha, Nebraska, USA. I found Wohlner’s baquette to be superior especially in taste and aroma.